Hai đại gia đồ họa ATI và nVIDIA đều có số người dùng và fan hâm mộ riêng nhưng mình chưa chắc ưu thế nghiên về bên nào, mình vừa tìm được trên mạng một dòng sản phẩm Card Vga mới của Asus với công nghệ ép xung hàng đầu thế giới và 2 mẫu card này đã lập nên một kỷ lục thế giới mới về công nghệ Overclock. Elmor and Kinc have been spending the weekend benching with ASUS' latest hardware and with the help of some exotic cooling, they were been able to move the bar another notch. 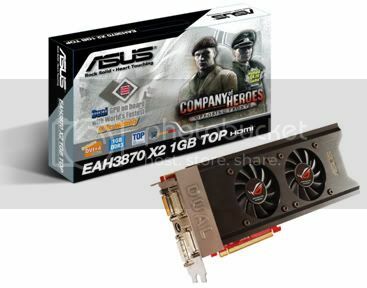 With two ASUS EAH3870X2 TOP, which sports two AMD RV670 circuits on one PCB, they had four graphics cores working together to break the world record. In the end they were able to reach 32,601 points. 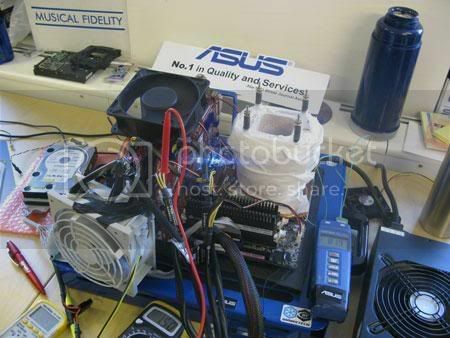 They used ASUS recently launched P5E64 WS Pro motherboard along with an Intel Core 2 Extreme QX9650, C1 stepping, cooled by some liquid nitrogen. The processor was overclocked to a mere 5.719GHz, which is 100MHz less than the previous world record, but still enough for them to break it. 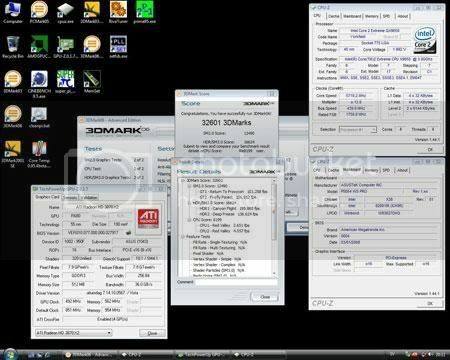 The graphics cards were overclocked to 990MHz, while the real key was the memory overclock that reached 1125MHz, much thanks to the 0.8ns Qimonda chips using ASUS' in-house design. The cards were air-cooled. Unfortunately, the ORB doesn't accept the C1 stepping, which means the score can't be published there yet. We expect Futuremark to update the ORB with support as soon as possible. Until then you will have to settle for pictures of the system and the screenshot confirming the score.